Because we did Baby-Led Weaning with the twins, they don't really have any experience with spoons and bowls, but I am so glad that I now have the Boon Catch Bowls and Benders! 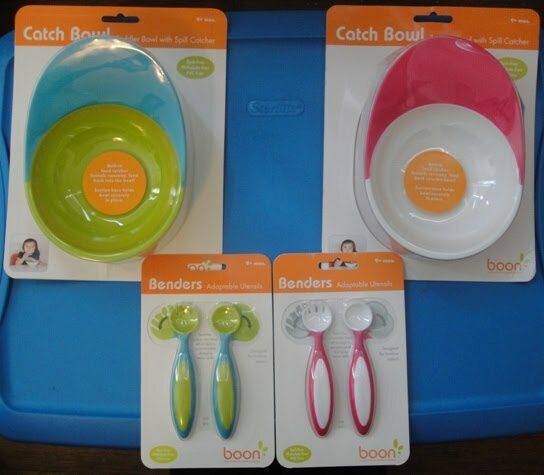 The Boon Catch Bowls (available in orange, pink and blue/green) are toddler bowls with a special spill catcher. The food catcher funnels right back into the bowl, and there is suction on the bottom of the bowl to hold it securely in place. It's made for babies 9 months and up, and it's really perfect for first-time eaters. The bowl is one-piece and dishwasher-safe, and it's also BpA-free, Phthalate-free and PVC-free. Well, as you can see by the following pictures, the twins had a lot of fun with the bowls and the benders. I was VERY impressed at how well the suction holds onto their trays. I have other bowls with suction on the bottom, but it doesn't hold for even a second. It took until the end of meal time, when the trays and bowls were filthy with yogurt, for them to finally be able to pull the bowls off. The catch also did a very good job keeping yogurt off of their laps, although they still got yogurt everywhere else...including on me. The bowl is a very good size, so there's less opportunity for mess (yogurt excluded because it makes a mess in all cases) and older toddlers can still have a full meal without needing a refill. This is really a fantastic product, and I can't think of any cons. I really tried, but I have nothing. Overall: I give the Boon Catch Bowls a 10/10. The Boon Benders are adaptable utensils whose heads bend in order to be most useful to your child. Fine motor skills are always changing, so the heads go to the left and right to accommodate this. The handles are soft with an easy-grip, and the Benders are also dishwasher-safe. Each set comes with a fork and a spoon, and they also come in three great colors (orange, pink and blue/green). As you can see from the above photos, the twins don't quite know how to handle a spoon yet. Chana was trying to use the handle end to get the yogurt, and Dovid preferred to hold the spoon in one hand while squishing the yogurt in the other. Chana also was using her hands more than the spoon, and eventually resorted to licking the bowl at the end. I didn't bother bending the spoons for this feeding since they aren't quite sure how spoons work yet, but once they get the hang of it I'll be able to see how much bending is needed. They might not even need bending since they're getting older, but I guess we'll see! The spoons are just the right size for their hands and the grip is soft and doesn't slip. The mouth end of the spoon is a bit small, and Chana was having trouble getting all of the yogurt out of the bottom of the spoon. Overall: I give the Boon Benders a 9/10. One very lucky reader is going to win their own set of Boon Benders (your choice of color)! Visit the Boon website, comment here and tell me what other product you would love to try. 2) Follow @booninc on Twitter and comment here with your Twitter screenname. 5) Become a fan of Boon Inc on Facebook. 8) Subscribe to the Boon news blog via RSS or email. 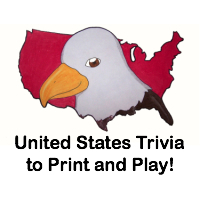 This giveaway will close on June 28, 2010 at midnight. We were sent the Boon Catch Bowls and Benders free of charge for the sole purpose of this review; no other compensation was received. All opinions expressed are my own. I 'd like to have the frog pod. I entered the goodbye detergent giveaway. I would love to try the green potty bench. What adorable kids you have! I'm stopping by from SITS to welcome you to the group. I would like to try the blue potty bench! I entered your baby pool. I used the name Heather. I really like the Otto Animal Bag. Thanks. I love the grass drying rack! I follow boon on twitter! I would love to try the Squirt spoon! Wow, I'd LOVE to try their new Plum dispensing spoon with my grandson...where do they get such neat ideas?!? The grass drying rack looks neat - would love to try it out!! I would love to try the round snack trap! I would love their flair pedestal high chair (pink). I follow boon on twitter. I'm a fan of Boon on FB. I'm a fan of your blog on FB. I follow your personal blog too. I voted for you on topmommyblogs. I voted for you on topbabyblogs. I voted for you on the top 100 blogs and websites. I'd love to try the "Flo"